The following excerpts are from John Yau's introduction to the catalog for a retrospective of works by Forrest Bess that was exhibited at Hirschl & Adler Modern in New York (April 21-May14, 1988) and the Museum of Contemporary Art in Chicago (September 10-October 16, 1988). Forest Bess was born on October 5, 1911, in Bay City, Texas, a farming, fishing, and petrochemical community on the Gulf Coast. In 1977, at the age of 66, he died from skin cancer in a Bay City nursing home. Between entering the world and leaving it, he endured visions and a loneliness no one in their right mind would envy. 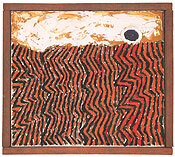 He fished and gathered bait for a living (the years spent in the sun aggravated his cancer), carried on a lively correspondence with Meyer Schapiro, had six solo exhibitions in the Betty Parsons Gallery [New York] between 1949 and 1967, and firmly believed he had discovered the key to immortality. He was an autodidact, a simple man, a visionary, an innocent, and a crank. It would be easy to romanticize Bess' lifelong isolation. He himself admired Vincent van Gogh and Albert Pinkham Ryder, and dedicated paintings to them. He was also a man who felt uncomfortable everywhere but in Bay City, where he lived alone on a strip of land that was accessible only by boat, and was considered by many of the local residents to be an eccentric. In a letter written to Meyer Schapiro in the late '40s, Bess revealed the reason behind his self-imposed isolation: "I try to tell myself that only by breaking completely away from society can I arrive at a reasonable existence." Among American Modernists, Bess belongs to the tradition which fights to reinvest symbols with meaning. In this regard, he shares something with Louise Bourgeois, Arshile Gorky, Alfred Jensen, and Myron Stout. If one of the dialectical processes operating throughout Modernism's evolvement is the conflict between description and abstraction, as some critics have suggested, then on one side are those artists who are desperately trying to inculcate meaning into their pictorial language without submitting to the puritanical structures inherent in historicist notions of progress, while on the other side are those who tread the decorative realm and believe progress and style form a linear path. Bess was able to tap into his "unconscious" quite easily. In an article he published in a Bay City newspaper in 1951, he wrote: "I term myself a visionary artist for lack of a better word. Something seen otherwise than by ordinary sight. I can close my eyes in a dark room and if there is no outside noise or attraction, plus, if there is no conscious effort on my part -- then I can see color, lines, patterns, and forms that makeup my canvases. I have always copied these arrangements without elaboration."